TENMAT Firefly 109 Fire and Acoustic Socket / Switch Box Covers are a cost effective and simple solution for protecting electrical switch and socket boxes when fitted in fire and acoustic rated walls. The intumescent material fully encases the socket to provide an acoustic seal but in a fire situation it expands and seals the hole made for the sockets to limit fire spread for up to 120 minutes. The Socket Box Covers are pre-formed and can be installed in seconds without assembly or adhesives. The simple mechanical fix ensures the cover will not be damaged or removed if the socket is replaced or adjusted providing peace of mind for the installer. 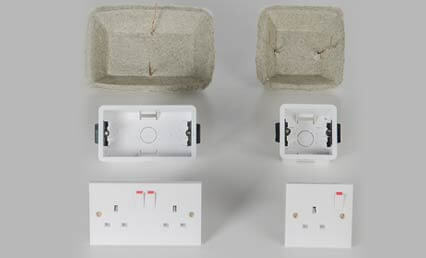 Offering significant labour and cost savings over plasterboard lining or putty pad solutions, the Socket Box Covers are available to suit both single and double sockets. Tested in accordance with BS EN ISO 140-3:1995 and BS EN ISO 717-1:1997 under UKAS conditions in a plasterboard partition construction.